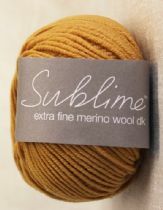 Launched in 2006, Sublime was hailed as the new face of hand knitting with its collection of the most exquisite, natural yarns, most beautiful, soft colours and the most inspirational designs. 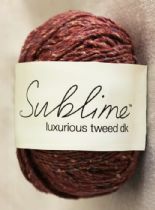 Sublime is part of Sirdar Spinning Ltd, a company with over 130 years experience in hand knitting yarns and designs. Sirdar is world renowned as a leading hand brand, with its finger on the pulse of all that is hand knit. 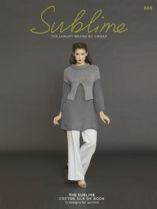 Now established as a global brand, Sublime has helped inspire a new generation of knitters through its luxurious fibres and its stylish, wearable designs. Well known for the most fabulous colours, the yarns are a designer’s dream and the Sublime design team research future fashion trends and colours in Italy and use their incredibly discerning taste and design expertise to create the most incredible new collections every season. 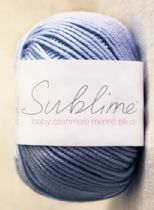 Created for the knitter who loves the quality of natural fibres and wants irresistible hand knits with a twist, Sublime often uses new stitch combinations or fascinating garment shapes that are an absolute joy to create. The Sublime baby collections are simply divine and make the most adorable gifts for a newborn child. The most exquisite, natural yarns. The most beautiful, soft colours. Sublime Eden is an incredibly special yarn. It has a beautiful wool and cotton blend creating a fabric that has the most impeccable stitch definition, whilst remaining wonderfully light. Luxurious tweed dk Sublime luxurious tweed dk is made exclusively for Sublime in Southern Argentina using the finest wool and the softest cotton spun with colourful neps. This gorgeously soft, summer tweed yarn comes in seven incredible colours inspired by the wide expanses and natural landscapes of the open plains – these breathtaking colours have been created for women, men, girls and boys and to create the most gorgeous, tweedy hand knits for the home. 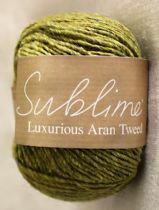 Sublime luxurious tweed dk is a standard double knitting yarn and will knit to all Sublime double knitting designs. It is machine washable and easy care. 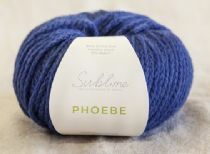 This fabulously wooly aran yarn is made for Sublime in Yorkshire, England using 100% wool in terrifically British colours - the most perfect Aran cream, a classic flannel grey and 6 intense, bold and modern shades. This Classic yarn knits to all Sublime Aran designs and creates gorgeously modern, classic hand knits for children, women and men.....with fabulously English style. 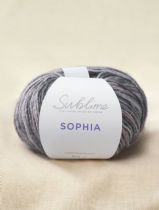 Made for Sublime in Italy using an incredibly light and luxurious blend of 94% extra fine merino wool and 6% nylon blend, Sublime Phoebe is crafted with a light-as-air knit construction to add a touch of modern softness. Perfect for huge and luxurious scarves, hats and the cosiest hand knits imaginable, this gorgeous chunky merino yarn gives you all the warmth you need for winter, without the weight. 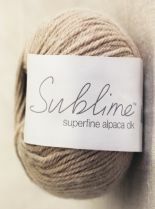 This exquisite, luxury yarn is made for Sublime in Peru using 100% superfine Alpaca - this yarn is perfect for creating hand knits with the softest and most luxurious touch. 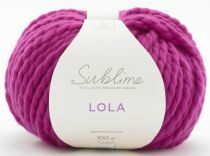 We launch this alpaca yarn with 6 of the most beautiful understated, classic colours for women, men, baby and home knits. Alpaca is the most incredible natural fibre that keeps you cosy in winter and cool in the Spring.